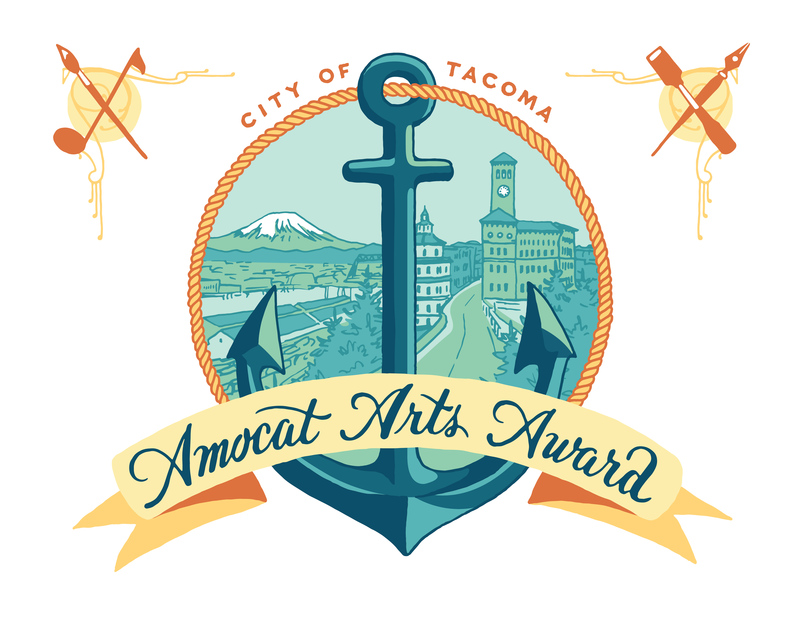 The Tacoma Arts Commission is accepting nominations for the 2017 AMOCAT Arts Awards, which recognize the people and organizations that positively impact Tacoma with their passion, innovation and commitment to the arts. Nominations will be accepted through Aug. 2, 2017. The Tacoma Arts Commission will review all nominations and select one finalist in each award category based on the breadth and depth of the nominee’s community impact as well as the quality of the work being done by the nominee. Mayor Strickland will present the 2017 AMOCAT Arts Awards at Kaleidoscope, the Tacoma Arts Month opening party on Oct. 4, 2017. Fill out the online nomination form via Submittable: https://tacomaarts.submittable.com/submit. In the category of Community Outreach by an Individual, past winners include: Lynn Di Nino, Jared Pappas-Kelley and Michael S. Lent, Laura and Matt Eklund, Lance Kagey and Tom Llewellyn, Linda Danforth, William Kupinse, Oliver Doriss, Stella Haioulani, Katy Evans, David Domkoski, Jessica Spring, Connie K. Walle, and Christopher Paul Jordan. In the category of Community Outreach by an Organization, past winners include: Tacoma Art Museum and Museum of Glass Education Programs, Arts Impact, Tacoma School of the Arts, Barefoot Studios, Victory Music, King’s Books, Hilltop Artists, Fab-5, D.A.S.H. Center for the Arts, The Grand Cinema, Puget Sound Book Artists, Asia Pacific Cultural Center, Tacoma Public Library, and Tacoma Youth Symphony Association. In the category of Arts Patron, past winners include: Sound Transit Art Program, Pierce Transit, Sixth Avenue Business District, The Weekly Volcano, Hotel Murano, City Arts, Urban Grace Church, The Greater Tacoma Community Foundation, Key Bank, Erivan and Helga Haub and family, ArtsFund, University of Washington Tacoma, and Metro Parks Tacoma. More information about the AMOCAT Arts Awards is available at cityoftacoma.org/amocat. 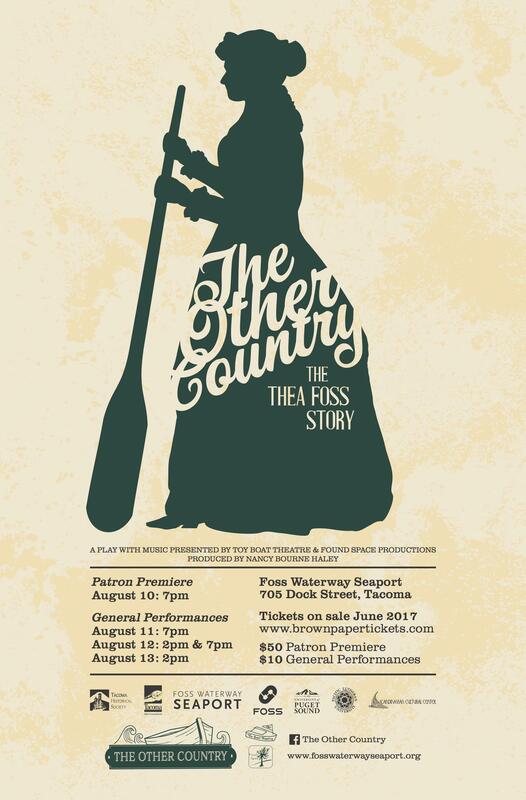 The Other Country is a community-based, site-specific event, placing the memorable Thea Foss story squarely in its original and authentic setting. The production will take place both inside and outside the dynamic and historic Foss Waterway Seaport, with five shows on August 10-13 (patron preview on August 10 is sold out.) This play celebrates our diverse backgrounds, the spirit of a strong female entrepreneur, and the enduring beauty and power of Puget Sound. Spanning from 1880-1927, The Other Country encompasses Thea’s humble beginnings in Norway, her marriage to Andrew Foss, and her family’s subsequent immigration to the United States. Once settled in Tacoma, this practical, intelligent, and determined woman began a small Puget Sound boat business. Due to Thea’s tenacity and business acumen, and with the help of her husband and children, this eventually became the famous Foss Maritime Company, which continues to thrive. A diverse company has been cast of twenty local actors and singers of multiple ages and local cultures and heritages, reflective of the “immigrants from many countries” referenced by Thea in her letters home, accompanied by 2 area musicians. The Other Country, produced by Nancy Bourne Haley, will be co-directed by Marilyn Bennett and Suzy Willhoft, artistic directors of the independent theatre companies Toy Boat Theatre and Found Space Productions, musically directed by Debbie Birkey and with costumes by Alex Lewington. First remembered as the character Annie Brennan in a series of stories in the Saturday Evening Post in the late 1920’s, Thea Foss came to America’s notice in film and TV as “Tugboat Annie” between 1930 and 1950. In 2006, local filmmakers Nancy Bourne Haley and Lucy Ostrander researched and co-produced a film, Finding Thea, about this remarkable woman and her Norway-to-the-Pacific-Northwest saga. In 2009 the film was aired on Norwegian national television and caught the attention of playwright Kristin Lyhmann, who was inspired to write Det Andre Landet — The Other Country, a play that tells the story of Thea and Andrew Foss from the vantage point of their native Norway. In summer, 2015, the play was produced in Foss’s homeland in SE Norway outside Skiptvet. Nancy Bourne Haley and Foss’s great-granddaughter Leslie Foss Johnson traveled to view the production. 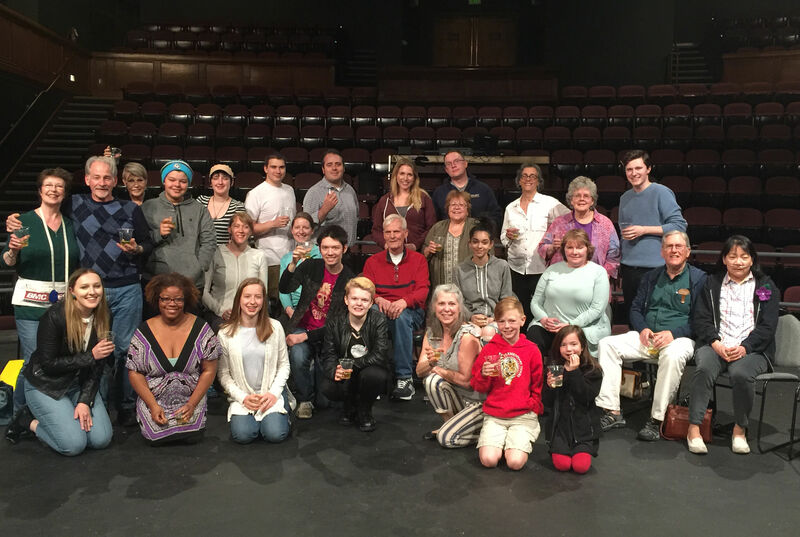 In the fall of 2015, News Tribune arts writer Rosemary Ponnekanti wrote about Bourne Haley’s film and trip to Norway, and suggested Nancy contact Marilyn Bennett and Suzy Willhoft, local theatre directors, about a possible production in Tacoma. Kari Nellie Groven, daughter of the playwright, and Janet Ruud of Tacoma, wrote an English translation of the play, from which this vignette was drawn. The Other Country is made possible thanks to these funders and facilitators: Foss Waterway Seaport, Pacific Lutheran University Scandinavian Cultural Center, University of Puget Sound Theatre Department, Foss Maritime Company, Florence Kilworth Foundation, Tacoma Arts Commission, Bayview Partners, Sons of Norway Foundation, University of Washington Tacoma College of Arts and Communication, Tacoma Historical Society, various Daughters of Norway lodges, and many kind individuals. What do you have planned for October? Will you be hosting an arts event in October? Do you want to contribute to the arts programming offered in Tacoma, build community, and benefit from free publicity? Submit your arts activity for inclusion in the 2017 Tacoma Arts Month online calendar! The Tacoma Arts Commission is seeking submissions of arts activities happening during our sixteenth annual Tacoma Arts Month this October. We are looking for a variety of activities spanning all categories of art and culture including but not limited to music, visual art, literary art, dance, theater, and film. If you will be hosting an exhibition, performance, class, workshop, reception, lecture, tour, artists’ market, celebration, meeting, presentation, or any other programming, let us know. We will list your arts event in an interactive and searchable online calendar of events on tacomaartsmonth.com. There is no cost to you. We will be promoting the many events going on throughout the month through newspaper and magazine advertisements and articles, electronic newsletters, television ads, radio ads, and through a variety of social media outlets. This month would not be possible without the participation of local businesses, organizations, and community members. We encourage you to participate by hosting your own arts activity or event. The deadline for the first round of submissions is August 7, 2017. We will accept activities on a rolling basis after that but submitting your information by August 7th will ensure that your activity is included in the first round of information that will go out. Your arts activity must be located within the City of Tacoma limits and occur during the month of October. Fill out the online submission form via Submittable: https://tacomaarts.submittable.com/submit. Please note: If you are submitting multiple events, please fill out a form for each event. Tacoma’s Arts & Economic Prosperity study results are in! In 2016, the City of Tacoma’s Office of Arts & Cultural Vitality worked with Americans for the Arts, the nation’s leading nonprofit organization for advancing the arts and arts education, in conducting a national study of the economic impact of the nonprofit arts and culture industry. The study, Arts & Economic Prosperity 5, involved the collection and analysis of organization and audience surveys. In the City of Tacoma, 66 of the 118 eligible nonprofit arts and cultural organizations participated in this study. In addition, a total of 1,124 valid audience-intercept surveys were collected from attendees to nonprofit arts and cultural performances, events, and exhibitions during 2016. 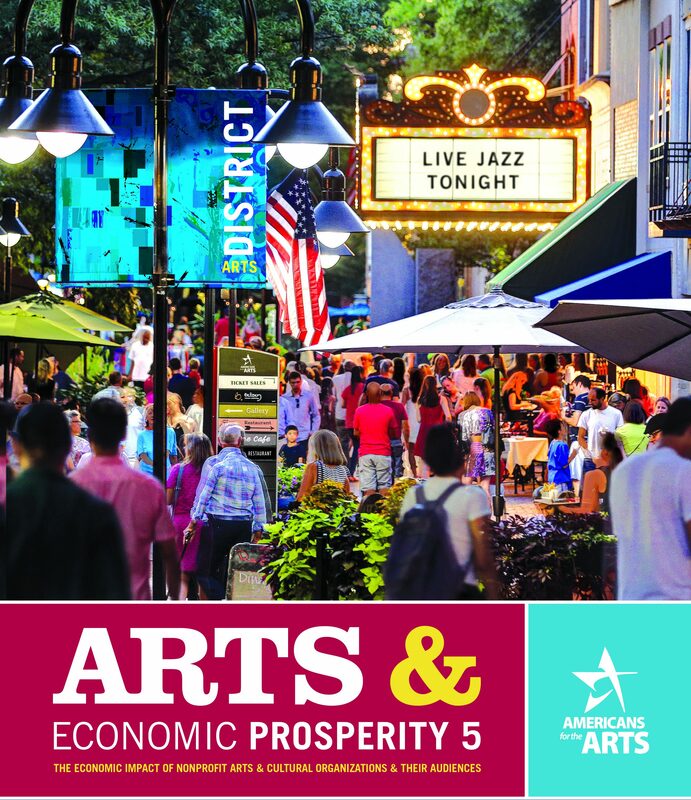 On June 17, Americans for the Arts officially released the national and local findings of the Arts & Economic Prosperity 5 study and the findings are overwhelmingly positive. The study shows that Tacoma’s non-profit arts and culture industry generates $137.2 million in total economic activity every year! This spending—$74.6 million by nonprofit arts and cultural organizations and an additional $62.6 million in event-related spending by their audiences (not including cost of event admission)—supports 3,656 full-time equivalent jobs, generates $86 million in household income to local residents, and delivers $14 million in local and state government revenue. This economic impact study sends a strong signal that when we support the arts, we not only enhance our quality of life, but we also invest in the City of Tacoma’s economic well-being. Nationally, the nonprofit arts industry generates $166.3 billion of economic activity — $63.8 billion in spending by arts and cultural organizations and an additional $102.5 billion in event-related expenditures by their audiences. This activity supports 4.6 million jobs and generates $27.5 billion in revenue to local, state and federal governments. The City of Tacoma’s Office of Arts & Cultural Vitality is very pleased to present the full study findings to you; we hope that you will find this data to be useful in your own advocacy work. All information can be found at www.cityoftacoma.org/aep or you can access the findings by following the links below.